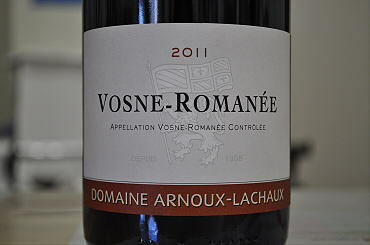 Like his Nuits from the Corvees Pagets, Lachaux's 2006 Vosne Romanee Les Chaumes exhibits unusual sheer density for its vintage, allied to refined texture and a sense of energy, fluidity, and sheer primary fruit juiciness. Bittersweet black fruits, flowers, and herbal concentrates ? as well as their high-toned, distillate-like aromatic counterparts ? mingle with smoked meat and focus to a strikingly piquant point in the finish, yet the wine's bitter and chalky elements do not drive it into austerity thanks to its clear, pure fruit vivacity that leaves your palate feeling cleansed and invigorated. I would wait a few years to revisit this and count on a dozen or more of very active life. Produced from paltry yields of 9 hectoliters per hectare, the 2003 Vosne-Romanee Les Chaumes is a big, medium-bodied, structured wine. Concentrated and deep, its red and black cherry-dominated character is jam-packed with ripe tannin that will require cellaring. Anticipated maturity: 2009-2015. The dark-colored 2002 Vosne-Romanee Les Chaumes bursts forth with licorice-imbued black cherry fruit aromas. This medium-bodied effort exhibits outstanding concentration, depth, and freshness. Copious quantities of black, tar-laced fruits can be found in its structured character. Lachaux stated that this will be the last of the 2002s to be bottled to allow its slightly firm tannin to soften during an extended elevage. Projected maturity: 2008-2014. The 2016 Vosne-Romanee 1er Cru Les Suchots is one of the highlights of the range this year, offering up a complex bouquet of rose petal, Asian spices, wild berries and sapid bass notes of grilled game bird and smoke. On the palate, it's full-bodied, ample and layered, with satiny structuring tannins, an intensely concentrated core of fruit, and a long, resonant finish. 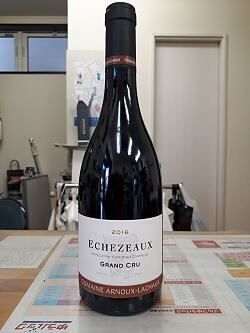 This is a powerful, complete and tight-knit Suchots that will really reward bottle age. Fashioned from yields 50% below normal, the 2003 Vosne-Romanee Les Suchots boasts a mouth-watering, intensely aromatic nose of waxy black cherries, spices, and chocolate. As this broad wine enters the mouth it instantly envelopes the palate with candied dark fruits. Concentrated, medium to full-bodied, and velvety-textured, this admirably persistent effort lingers in the finish, displaying additional layers of red fruits intermingled with ripe tannin. Projected maturity: 2009-2020. Candied red cherries and raspberries can be discerned in the wonderful aromatics of the 2001 Vosne-Romanee Les Suchots. Satin-textured and medium-bodied, it bastes the palate with lovely red cherry fruit. Fresh, pure, and structured, this wine possesses a long, well-endowed finish. Projected maturity: 2005-2012. 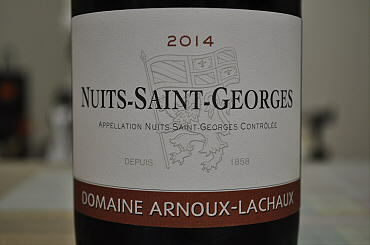 Lachaux lost half of his crop in this vineyard to frost, but the 2016 Echezeaux Grand Cru is superb, offering up a deep bouquet of wild berries, orange rind and mossy soil. On the palate, the wine is full-bodied, deep and expansive, with a firm, tight-knit core, excellent concentration and a rich chassis of structuring tannin, underpinned by vibrant acids. This will need and reward time, but it's one of the finest renditions of this site to date from Charles Lachaux. The 1998 Romanee-St.-Vivant has a nose reminiscent of perfume, red flowers, spices, and white pepper. Medium to full-bodied, and possessing outstanding depth, concentration, and elegance to its chewy-textured character, this is a jammy, red fruit-packed wine. Projected maturity: now-2010.